ellehermansen: Sleep Cycle Alarm Clock App for iPhone! Having trouble sleeping? Do you find you are super tired when your alarm clock goes off in the morning, even though you had a full 8 hours of rest? Did you know that this iPhone application can detect your sleeping patterns so well that it can tell when you are in your deepest sleep and when you are essentially sleeping lighter, allowing the alarm to wake you at the perfect time for you to feel good? 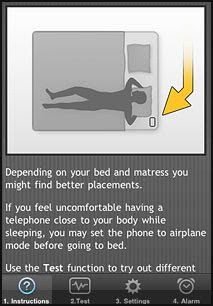 You set it within a 30-minute window when you would like to wake up and you place your iPhone on the bed between the mattress and the sheet, while letting it charge - and voila! Did you know that if your alarm wakes you at your most deep sleep, you are actually tired and off the whole day? Crazy! 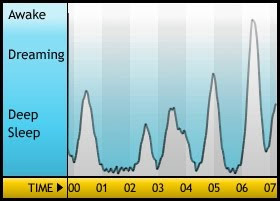 Here is a graph of a normal sleep cycle. 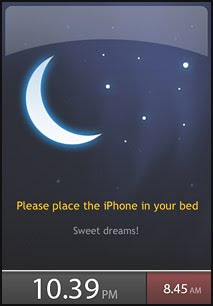 This application does adjust to all different sleeping patterns! Waking up in the lightest sleep phase feels like waking without an alarm clock - it is a natural way to wake up where you feel rested and relaxed. "It just works. Period. It does exactly what it advertises which is absolutely amazing." Since you move differently in bed during the different phases, Sleep Cycle uses the accelerometer in your iPhone to monitor your movement to determine which sleep phase you are in." Check more about it here! did you try the app? I did, and I found it's quite a hassle to deal with the charger cable and putting the phone under the linen, so I can't kick it out...I got myself one of those actual alarm clocks that track your sleep cycles (http://www.axbo.com) and I have to say, even only the comfort of only having to put on a comfy wristband was worth the money. That looks pretty awesome, Ida! Tonight I will write about another great one that is still for pre-order, so if that one doesn't work for you, this one might! It might be a later post but it will be up there to check out! Good to know about this one too! Thanks so much!